It documents that last hot metal printing at the New York Times in 1978. Its well made and fascinating and worth half-an-hour of anyones times to watch. I love history, I love buildings of all ages, one of my favourite things to do is to find details in buildings of past uses, features or brickwork that show what the building might have been used for in the past or how its been changed. Sometimes though, in fact almost always i can’t shake the feeling that the past didn’t really exist! It’s a weird feeling. We’re so surrounded by the present and time moves relatively slowly when you are observing it. 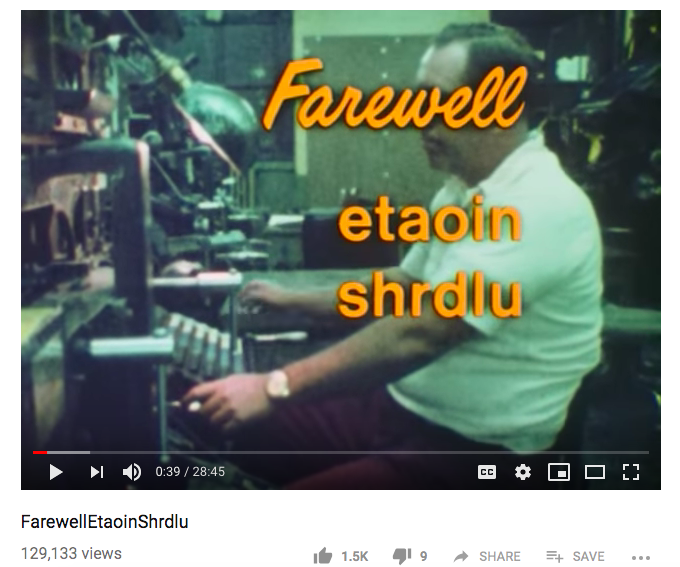 When Farewell etaoin shrdlu was made I was 4 years old but having lived in a world of rapidly advancing technology, I almost can’t believe not only how antiquated and Heath-Robinson the hot metal process was, but how dated and ancient the computerised cold press machines were that replaced it. Silver plated forks for fancy dinning. Fancy, but need polishing constantly. I went through a phase, fairly recently of desiring real silverware. But now I understand why we don’t use it. Silverware (this is probably no surprise to many) tarnishes constantly. As a moody twenty-something I read a lot of books about households and servants and such and in those they are constantly polishing silverware… I always thought it was just fancy busy-work. Anyway, I don’t have so much as a conclusion on busyness. But with all the labour saving equipment we have, albeit that housekeeping servants are mostly a thing of the past, how is it that we are busier than ever? Luddites did not smash machinery because they were technophobic, they did so because the machines were taking away the work that sustained them… and I guess they also didn’t like capitalist. I think some of us sometimes have a tendency to look back at the past as a warm space of safety and simplicity and I would dearly love to be able to go there, maybe just to the 50s or 60s to look at some of the building and infrastructure… but I want to live in today and be firmly moving towards the future.